Actor Yoo Ah In (유아인) attended the press conference of SBS drama, 'Fashion King (패션왕)' held on March 14, 2012 in Seoul, South Korea. 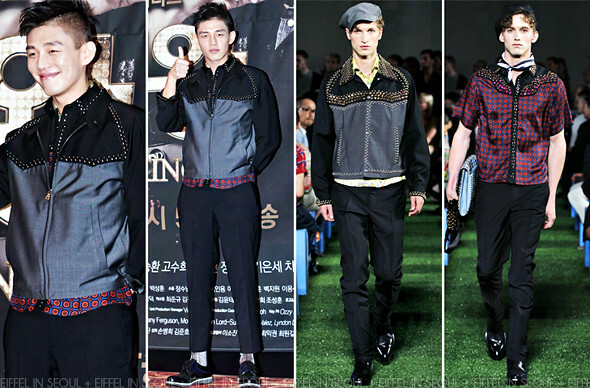 The main lead of the show wore an ensemble from Prada Spring/Summer 2012 menswear collection. Without a doubt, Yoo Ah In (유아인) is one of the rather fashionable young actor around. He always look well put together. Love the printed red shirt underneath the jacket, giving it the 'peekaboo' element. Loving the look ankles up, wished he opted for darker colored socks. 'Fashion King (패션왕)' airs every Monday and Tuesdays on SBS network.